Today's post is going to be lots of fun! We're going to play Name that QUACK! The internet can be a valuable source of information for most folks but you have to use it with caution. While searching for lupus communities online I have stumbled across peddlers claiming how their lupus was cured by snake oil, or oxygen treatments! Even shady authors who claim to reveal a cure for lupus if you purchase their books, and even going as far as calling it a "lupus bible"! If the thousands of esteemed doctors with high credentials, prestigious medical degrees, and funding from the world's leading lupus organizations have missed something; I'm sure it didn't have anything to do with taking a charcoal bath to cure lupus! I'll plug some links to the lupus Quacks below. Take a peek to make sure you don't fall victim to their lies, and please share some of your own if you've ever come across any! "Ludicrous headline or cure. What’s the most absurd thing you’ve heard about your condition? Whether it’s a cure you’re clearly supposed to try or a headline you’ve come across – the internet is rampant with examples of misinformation and quackery. Let’s share them and have a quick laugh before we get return to our regularly scheduled advocacy." 1: Cure Lupus Naturally! : This site rambles on and on about how they have a natural cure to lupus, and it's full of shady "reviews" from so called patients. Of course they only reveal this "cure" if you pay $29.95 for a book through paypal. Nice try, but we're NOT falling for this one! 2. Natural Lupus Cures: Now this site made me laugh so hard I fell out my chair! First of all why does the headline say they can cure herpes, and second are they really telling patients that INGESTING CHARCOAL or taking a CHARCOAL bath will cure them of lupus???? Where is the report button!!!!! 3. The Lupus Reversing Breakthrough: This site tries to peddle a book claiming it can show you how to reverse lupus, and even goes as far as proclaiming Nobel prize winners and top doctors participated. Supposedly written by a health expert who didn't even pop up in a Google search! Which is impossible because EVERYTHING can be found on Google! Not to mention this self acclaimed expert has NO degrees, and when I searched for the company listed on the bottom there was ZERO mentions. No surprise there, it's obvious Quackery! 4. Le'Vive Dietary Supplement: Interesting enough is WHY a fashion site is trying to recommend a drink as a cure to lupus! Even more ridiculous is the "sales pitch" that you can listen in to. Keep in mind folks if the FDA does not approve it, Don't TRUST it! 5. Wanted: The Chronically ill! : Yes, this site not only claims to cure multiple diseases but outright states that they will PAY chronically ill patients to leave a good review on their products! QuackWatch Several lupus patients I know have mentioned this site to me. It helps you spot phony advertisements and peddlers claiming to cure a disease or illness. They even share 25 ways to spot quacks and vitamin pushers, as well as "How to spot a Quack Website" and more! 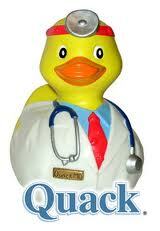 Hope you've learned how to spot those infamous Quacks and feel free to share some you've come across. You know it Annie! No way am I allowing patients to be fooled by these crazy shenanigans! Quakery is rampant everywhere. People want to believe that there is a cure and that doctors don't have to be involved because they don't trust them. It's all a big conspiracy. My mother believes that even though I have many symptoms of lupus and was tested by three different doctors that I don't have lupus. She keeps trying to tell me about different pills that cure everything. Recently, she found a "doctor" that says that he's got a cure for aging and everything wrong with you. It's collagen. You ingest it in pill form and you get all better! I asked a REAL doctor about it, and he said just eat animal fat. Same thing. But eating it is not going to do a darn thing for you... These people need to be locked up! You're so right Raechele! It saddens me to see all the culprits out there who are preying on the sick with their QUACKERY schemes! So many of us are just desperate for a cure but we've got to open our eyes and notice when something isn't REAL! Hey Tiffany here's another link for people who "think" they can heal Lupus naturally while pressuring you to buy a book. http://www.healing-lupus.com/ I was always taught that you shouldn't have to pay for something that should be free. If I found a cure for Lupus (which is my ultimate goal once I graduate undergrad and graduate school ^_^) I so would not be charging others like me to jump on the "Cure Train" psssh quack is right!